People with an eye for architecture and design and a mind for business can put their skills to work with a degree in construction management. Working for contractors and management firms, construction managers take care of all aspects of a construction project, from the planning stages through every detail of the construction phase. This guide takes a look at education and career opportunities for those interested in a construction management degree. Kent Hikida, is an American Institute of Architecture-certified professor of construction management at Pratt Institute in New York City, and an architect at Gensler, an architecture firm. He has been involved in over 2 million square feet of construction. He currently lives in New York City with his wife and daughter. A construction management degree program may be beneficial for those who want to gain an overview of the materials and methods used throughout the construction process. Students will be able to learn about large-scale projects from the planning to completion stages. To help college-bound individuals choose the best program for them, we weighed every construction management degree program in the country to create a ranked list of the top schools based on our criteria. Explore the top construction management degree programs here. Brigham Young University in Provo, Utah, offers a unique, vocationally focused 4-year bachelor's program in construction management. Students who want to pursue a career in construction management can enter this rigorous program, which requires 119-121 credit hours of coursework. Although many of the courses are pre-determined, there are a variety of elective options students can choose from throughout their schooling. The program provides a foundation in various areas relevant for construction management success such as construction technology, business, architecture and engineering, preparing students with career skills that can be applied to many subfields. The program boasts a 90% post-graduation job placement rate and claims that graduates earn an average starting salary of $50,000 per year. Many of BYU's construction management students continue their education in architecture, law or business. Graduates of University of Oklahoma's construction science bachelor's degree program learn the communication and technical skills necessary to manage the builders, machinery and materials that ensure a construction project is completed on budget and on time. Students take courses in construction science, architecture and business and can study abroad through programs in Zambia, Rome, Germany and Dubai. Potential career choices include general contractor, architect, or developer. Graduates have a 90 percent job placement rate. OU offers many student support services, including a math center, writing center, academic advising, career counseling, financial aid and even a food pantry for students in need. 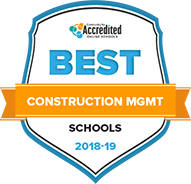 The school, located in Norman, is accredited by the Higher Learning Commission and the four-year, 120-credit program construction science is accredited by the American Council for Construction Education. Louisiana State University offers a BS in construction management as well as a 100% online post-baccalaureate certificate program in construction management. The 4-year, 122-credit, on campus degree takes an interdisciplinary approach with courses in engineering, architecture, construction design, technology and business and includes a business administration minor and a technical sales minor. Students can focus their degrees on industrial, highway, commercial or residential construction. Construction industry career areas for graduates include planning, cost estimating, scheduling and supervision. LSU's online post-baccalaureate certificate program consists of six core construction management courses and provides the basic core knowledge needed for a construction manager. The program prepares individuals, including graduate students in areas of architecture and business or qualified military personnel, for a career change into construction management. Academic advising, tutoring, financial aid and career counseling are available for all students. LSU has several campuses throughout the state; the main one is located in Baton Rouge. The school is accredited by the Southern Association of Colleges and Schools Commission on Colleges and the construction management program by the American Council for Construction Education. Students looking for construction management programs will find 2 options at the University of Minnesota - a bachelor's degree and a certificate program. The bachelor's degree prepares students for a leadership role in construction with a focus on design and construction technologies, contracts and specifications, project management and quality assurance. There are 4 tracks - commercial construction, facility management, highway heavy and civil works and residential construction. Students can apply to the program after completing at least 45 credits, which will count toward the 120-credit total. Career positions may include field engineer, project manager, and engineering technician. Students seeking to enter the 19-credit construction management certificate program must also have 45 credits of completed course work for admission. That program focuses on construction industry management skills, including estimating documents, scheduling contracts and managing projects. This certificate can be applied toward the BS in construction management. Student resources include a Construction and Facility Management Student Association as well as study skills support, career counseling and financial aid. The University of Minnesota has five locations, with the flagship campus located in Minneapolis. It is accredited by the Higher Learning Commission. The BS degree in building construction science at Mississippi State University is an interdisciplinary curriculum within the School of Architecture, College of Engineering, College of Business and the building construction industry. The integration of architectural, engineering, construction and business practices is a different approach from a traditional construction technology curriculum that separates subject areas into distinct courses. It provides a base knowledge in business, engineering and construction sciences. The 4-year program requires 124 credit hours. Student support services include advising, tutoring and career counseling as well as financial aid for eligible students. Mississippi State University is accredited by the Southern Association of Colleges and Schools Commission on Colleges. Students are prepared to lead the most complicated construction projects through the BS degree in Construction at the University of Wisconsin-Stout in Menomonie, WI. The program focuses on technical and engineering processes along with the business, management and marketing aspects of the construction industry. Courses include structural systems, site engineering, construction methods and materials, architectural technology, building mechanical systems, business and management and communications. A required cooperative education or field experience provides practical real-world training. The program requires 120 credits to graduate. Career options after graduation include project management, estimating, architecture, engineering and project supervision. The school offers advising, career counseling and financial aid for eligible students. UW-Stout is accredited by the Higher Learning Commission and the construction program by the American Council of Construction Education. The BS Degree in Construction Management program at Arizona State University teaches students to helm construction projects from residential and commercial buildings to infrastructure projects such as roads, bridges and large facilities. The curriculum combines engineering and business. Students learn computer and technical skills, math, cost estimating, scheduling, surveying, blueprint reading, contracts, problem solving, people skills, management and leadership. The program offers 5 areas of emphasis - commercial building, heavy construction (roads, bridges, dams), specialty construction (mechanical and electrical), residential and the concrete industry. Two mandatory summer internships - field and managerial - provide hands-on experience. Graduates can pursue careers such as project managers, estimators, planners, schedulers and project engineers. The school has an 85% job placement rate at graduation and 100% within the first 3 months following graduation. Arizona State, located in Tempe, is accredited by the Higher Learning Commission of the North Central Association of Schools and Colleges and the construction program by the American Council for Construction Education. The BS Degree in Construction Management at Utica College prepares students for careers centered on the management of projects in every sector of the construction industry. The 4-year program includes a balance of technical construction knowledge with managerial, financial and planning skills. Courses include mechanical and electrical systems, methods and materials, construction finance, managerial accounting, and labor relations and collective bargaining. Students must earn 125 credits to graduate. Tutoring, counseling and financial aid services are available to all students. Utica is accredited by the Commission on Higher Education of the Middle States Association of Colleges and Schools. A Building Sciences with a concentration in Construction Management B.S. degree at Appalachian State University develops students' skills in both the management and technological aspects of the construction industry. An interdisciplinary approach to design and construction helps graduates become industry leaders. Courses include building systems, materials and methods, planning and scheduling, statics and strength of structures, occupational safety, and sustainable architectural design. The 4-year program requires 122 semester hours and a professional internship. Graduates can expect to pursue careers as a construction manager, contractor, home builder, industrial engineer or project manager. The school offers academic advising, career and financial aid services. Appalachian University, located in Boone, NC, is accredited by the Southern Association of Colleges and Schools Commission on Colleges. John Brown University is a Christian-based learning institution accredited by the Higher Learning Commission and the American Council for Construction Education. Students can earn a Bachelor of Science in Construction Management by completing 133 semester hours over the course of 4 years, or spend 2 years working toward 62 semester hours to receive an Associate of Science in Construction Management. The program encourages students to get hands-on experience by joining the school's student-run Eagle Construction Company, or entering the annual Samaritan's Purse Disaster Shelter Competition. Following graduation, you will be prepared to pass the American Concrete Institute Grade/Field Technician Certification, as well as the National Constructor Certification Exam. When the blueprints leave an architect’s office, the job of a construction manager begins. Balancing the budget, hiring the appropriate subcontractors, purchasing materials, and managing the schedule are just some of the tasks involved with steering a project from start to finish. On-time and on-budget are the watchwords for a construction manager, two goals that are well-served not only by practical experience, but also by a solid education that teaches the fundamental skills necessary for the job. Major employers look for construction managers with a minimum of a bachelor’s degree in a construction-related field. Construction managers enjoy comfortable salaries, with top earners commanding well into six figures a year, according to the U.S. Bureau of Labor Statistics. More than 100 accredited colleges and universities offer construction-related programs; prospective construction managers may also enter the field through degrees such as architecture or engineering. On-the-job experience is key to landing a job in construction management, but it’s also a good idea to have a college degree to back it up. While a high school diploma may suffice for some who have risen through the ranks, many employers prefer to see applicants with a post-secondary degree, explains the U.S. Bureau of Labor Statistics. To get experience and certification that increase their employment prospects, students can pursue degrees in construction management at various levels—associate, bachelor’s and master’s—both on-campus and online. An associate degree provides introductory knowledge about the fundamentals of construction management, and is designed to arm students with skills in leadership, time management and critical thinking. To enroll in an associate program, students must have a high school diploma or GED equivalent. Students should also make sure prospective colleges are accredited by the Accreditation Board for Engineering and Technology. Curriculum combines general education classes with specialized construction management courses, and generally takes two years to complete. Introduces the use of surveys in commercial, residential and road construction. Covers the process of estimating the full cost of construction projects. Topics include contracts, bonds and insurance. Examines the role of the project manager in planning, scheduling and overseeing a construction project through completion. An introduction to common materials and methods, including foundation work, use of wood and brick, and exterior and interior finishes. More in-depth than an associate degree, a bachelor’s degree educates students in the fundamental principles and techniques of construction, as well as communication, mathematics, humanities, and behavioral and natural sciences, in preparation for administrative or managerial careers. Students should seek a university accredited by Accreditation Board for Engineering Technology and should expect to complete about 120-180 credit hours in the program. Introduction to the analysis of wood, steel and concrete structures. Covers structural loads and forces, columns, and trussed systems. Explores economic factors as they relate to decision making, with emphasis on rate of return, net present value, benefit-cost relationships, and multi-objective evaluation methods. Computer science and engineering examples are used to teach problem-solving through analysis and design. Students learn to interpret and present results from real-world case studies. Teaches the integration of safety and productivity measures into daily field operations through inspection and accountability. Examines accident causes and costs, and techniques to minimize risk. Obtaining a master’s degree opens the door to higher-paying jobs and better career prospects as students become experts in the field. Prospective students should already hold a bachelor’s degree in a construction-related field and have significant work experience. Students focus on more detailed areas of construction management, such as construction programming, cost control and project management. Programs also prepare students to receive certification as either an Associate Constructor (AC), or Certified Construction Manager (CCM). Master’s degrees usually require about 30 credit hours to complete. Students discuss the theories, principles, and techniques of construction planning and scheduling, with an emphasis on time management, costs, and use of resources. Covers the factors involved with sound decision-making, including identifying and analyzing risks. Explores advanced and emerging theories, tools and techniques used to plan and monitor construction projects and address uncertainties. Introduces methodologies, tools and techniques of infrastructure management. Course topics focus on performance measures; deterioration modeling; life-cycle costs; optimization; budgeting and financial management; and policy analysis. Make sure the school offers the level of education you are seeking. Check out professor backgrounds and examine the curriculum to verify that coursework is high-quality and relevant to the field you plan to work in upon graduation. Employers favor accredited degree programs, as they are independently evaluated to guarantee an education that meets high standards and is applicable in the workplace. Construction management programs should be accredited by Accreditation Board for Engineering Technology. ABET provides specialized accreditation for engineering and construction-related programs at institutions that already hold regional or national accreditation. Currently, there are 3,569 ABET-accredited programs at 714 institutions for students to choose from. While architects and designers handle the majority of the technical aspects of building design, construction managers need to have a solid understanding of the computer programs used. Look for a degree program with a curriculum that covers at least the basics of Automatic Computer Aided Design, ProEst, or other relevant software. In addition to classroom instruction, prospective construction managers will benefit from real-world experience before entering the workforce. Degree programs that offer opportunities to shadow a professional at work, gain internship experience, or visit functioning construction sites will prepare students for their careers. Certification is also attractive to employers; look for a program that gears education toward certification and prepares students for technical exams. Although certification is not required to work as a construction manager, holding a title as a Certified Construction Manager (CCM), Associate Constructor (AC), or a Certified Professional Constructor (CPC) can increase job prospects and fast-track your career advancement by demonstrating expertise to employers. Check schools’ job placement rates to see how many students obtained construction management jobs after completing a program. Researching the school’s alumni network and talking to current students can give you an idea of where graduates are headed after completing their programs. Construction managers work with architects, cost estimators, civil engineers and other subcontractors to supervise the design, budgeting and production of a project. Managers work in both main offices and on-site field offices to monitor progress and make day-to-day decisions. Salary depends on the industry, company size, location, years of experience and level of education. With a mandate of ensuring safety, inspectors visit construction sites to ensure that projects meet building codes and ordinances, zoning regulations and contract specifications. General supervision responsibilities include estimating materials needs and ordering supplies; inspecting equipment; ensuring that safety regulations are upheld; and monitoring project progress. Supervisors act as liaisons between contractors and management to coordinate activities and resolve issues. While a college education is not required, a bachelor’s degree typically leads to advancement in the field. Technicians assist civil engineers in the planning and design phases of project development. They visit job sites to evaluate conditions and collect and test materials. Employers often prefer technicians to have a degree from an accredited school, but it is not required. While not required, certification is a distinct advantage in construction management. Both students and professionals are eligible for varying levels of certification that can provide a competitive edge in the field. CCM certification demonstrates the dedication and knowledge necessary to complete projects in an efficient and timely manner. Obtaining CCM designation requires certain experience and education requirements, as well as passing a technical exam. The Construction Management Association of America awards the CCM title to qualified professionals who pass the examination. As the first level of certification in the Constructor Certification Program, Associate Constructor designation is ideal for students with a bachelor’s degree in construction management. Applicants must meet education and experience requirements and pass an examination to demonstrate skills in budgeting, communication and management. The AC examination is administered by the American Institute of Constructors. The second and highest level of certification in the Constructor Certification Program, CPC designation is aimed at those who have established careers and several years of project oversight and construction experience. Certification requires fulfilling education and experience requirements and passing the CPC examination, demonstrating skills in cost control, risk management and ethical decision-making. The American Institute of Constructors grants this designation to construction management professionals. Trends in construction management employment are shifting: college education is becoming increasingly important in this field. Many contracting or management firms will only hire those with a construction management degree, which also leads to higher pay and career advancement. Interning for a professional construction manager allows students to hone their skills and gain practical experience before entering the job market. Graduates who have completed an internship will look more attractive to employers, having some real-world job experience under their belts. Most construction professionals begin as assistants to established and experienced managers. These positions can last from several months to several years, and are often required as a stepping stone to earning promotions and offers for higher management positions. Although not required for most construction management jobs, certification as an Associate Constructor, Certified Professional Constructor, or Certified Construction Manager is a way to stand out to employers. In addition to technical expertise, construction managers use a host of business skills to best manage human and financial resources. A clear focus on the financial bottom-line and project timelines are fundamentals for success as a construction manager. Construction managers need leadership and communication skills to coordinate with multiple parties and delegate tasks to subcontractors and other workers. Knowing how to successfully supervise workers across all the parts of the process is a crucial skill to the overall progress of construction projects. Construction managers must have the knowledge and confidence to make on-the-spot decisions in emergency or deadline situations. Serving as liaisons between designers, clients, and workers means that construction managers need to make decisions that can hold up to the criticism of all parties. What has your job in construction management been like? Pros/cons? I am an architect and work with construction managers daily on the implementation of projects. The positive aspects of construction management are to work with a team of designers and builders to construct a project and to meet the client's expectations for schedule, cost, and quality. The challenges of construction management are the tight schedules, and managing changes and cost. Good communication is a key to successful construction management. What skills should students get out of a construction management education? Construction management students should understand the basics of cost estimating and scheduling. They should also develop good written and oral communication skills. Teamwork and collaboration skills are important, as are leadership skills and the ability to analyze and solve problems. It is also important for students to understand principles of sustainable construction (LEED), and how technology platforms can improve construction outcomes: BIM/Revit, Onscreen Take-Off, Microsoft Project, and PlanGrid/Buzzsaw/FTP sites. It should be noted that the technology platforms are the tools, not the solutions. Solutions are developed through critical thinking. What skills are looked for when hiring a construction manager or subcontractor? Most skills can be taught on the job and may vary slightly from firm to firm. The traits we look for when hiring a construction manager or subcontractor are good interpersonal and communication skills, evidence of teamwork and the ability to work well with others, the ability to remain calm under stress, humility (know what you know, and know what you don't know), honesty, hard work, and high ethical standards and a moral compass.